This is an easy one anyone should be able to duplicate in fifteen minutes. A real cruise control would maintain a set speed but this is basically a throttle lock so it just holds the throttle in position for you without having to keep tension on your wrist. The pictures basically show you how to do it. Get a bungee cord, I got a pack from the dollar store because it had a nice blue one. I bent one end over the mirror permanently so it can’t fall off. The other end I hooked it on then pulled the cord through it tight enough to hold the throttle in position then tied a knot in it and cut off the excess. When you don’t need it keep it like the first picture. 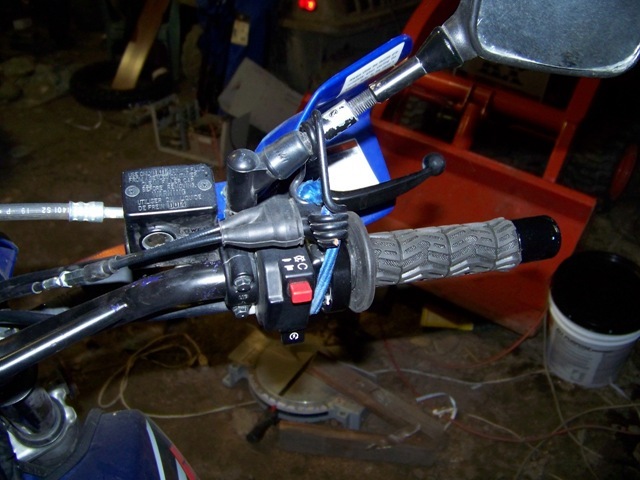 Then when you want it to work it takes a few seconds to unhook from the mirror and put in the gap between the grip and the throttle housing and hook back onto the mirror. 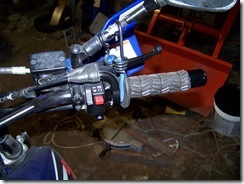 Your wrist will last much longer while riding with it even if you don’t take your hand off the throttle. It just eases the pressure you have to hold while riding.